England beat Scotland by 39 runs on the Duckworth/Lewis method in a rain-reduced one-day international to give Peter Moores a winning start in his second spell as head coach. After showers delayed the start until 16:00 BST, Ian Bell scored 50 to help England reach 167-6 in 20 overs. Michael Leask kept Scotland in contention with 42 off 16 balls. But his wicket triggered a collapse as the Scots slumped from 95-4 to 133-9, with James Tredwell taking 4-40. The unlikely venue of Mannofield Park in Aberdeen provided the backdrop for the start of a new era in English cricket as they look to recover from a chastening winter in which they were whitewashed in the Ashes and crashed out of the World Twenty20 at the Super 10 stage. Moores, who has replaced Andy Flower to reprise a role he held between 2007 and 2009, handed a debut to Nottinghamshire left-arm seamer Harry Gurney. Ian Bell surpassed Alec Stewart to become England's second-highest one-day run-scorer. Paul Collingwood is top of the pile with 5,092 runs, followed by Bell on 4,685, Stewart on 4,677 and Kevin Pietersen on 4,422. But for much of the day, it looked unlikely that any match would take place as persistent rain swept across the ground. However, 17 minutes before the final cut-off time for a match to start, Alastair Cook and Bell walked out to bat after being put in by Scotland captain Kyle Coetzer. The veteran duo quickly settled into a steady groove as they put on 87 for the first wicket. Bell was more aggressive, bringing up his fifty off 33 balls only to be bowled by the following delivery when he missed a paddle sweep at Rob Taylor. Further rain resulted in the match being reduced from 23 to 20 overs, but England continued to bat with authority in spite of some outstanding Scottish fielding. Cook was brilliantly caught on the boundary by a running Calum MacLeod for 44 and Jos Buttler fell to an even better catch by Taylor, who reached above his head to pluck the ball out of the air. Eoin Morgan kept England on course for an imposing total with some clean hitting before he was caught behind slashing at a wide ball from Iain Wardlaw. Josh Davey took two wickets in two balls in the final over but Chris Jordan ensured England ended on a high when he thrashed the last ball of the innings down the ground for six. James Anderson denied Scotland a fast start when he bowled both openers inside the first three overs. Buttler did his chances of replacing Matt Prior as England's Test wicketkeeper no favours when he dropped a regulation chance to remove Coetzer. But Scotland's captain did not go on to make the innings his team required as he was bowled around his legs in Tredwell's first over. Leask entertained the crowd and kept the contest alive with three huge sixes off Ravi Bopara and Tredwell. But just when Cook was beginning to look concerned, Leask picked out Anderson, who took the catch on the long-on boundary at the second attempt. From then on, the Scots imploded with four further wickets falling in the next five overs to guarantee England a morale-boosting victory. 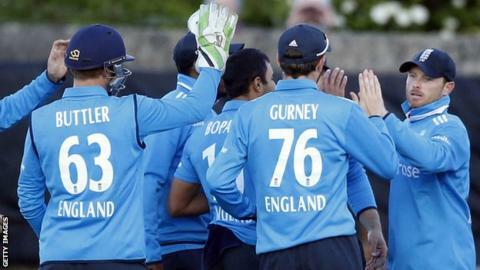 England will next face Sri Lanka in a Twenty20 international on 20 May before five one-dayers and two Tests.